Founded in 1980 and based in Co. Cork, Munster Tool Co has finalised an agreement with Chris Mulcahy to take on the Munster Tool Co franchise for Waterford and South Tipperary this summer. 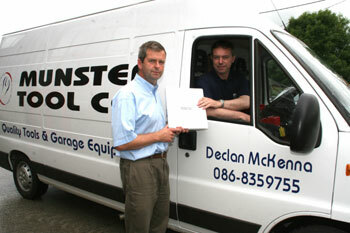 As well as this the company's seventh franchisee, Declan McKenna, has opened his business in Galway. These developments are part of Munster Tool Co's expansion programme that aims to have up to 20 franchise branches by 2009. 'For over 25 years we have built strong relationships with the top automotive tool manufacturers worldwide and we have established a reputation for supplying high quality products and support to our customers,' says Martin McMahon, Munster Tool Co's joint founder. 'However, we struggled to reach all areas of the Irish market. Franchising our sales and distribution activity means that our customers continue to get the high quality products and support that they deserve with a level of service that can only be provided by a local, owner-managed business.